You know the kind. It's the kind of voice the divides music critics and afficianados alike. It's the kind of voice that can end relationships or start them (seriously, it's happened to me both ways). Put simply, it's the kind of voice you hear and you either immediately fall in love with it, or you inexplicably hate it. We're not talking normal love, we're talking unswerving devotion, scary attachment issues, and plantitive stares at jewel cases. Artists that I have that scary kind of love and devotion for include Xiu Xiu's Jamie Stewart, Smog's Bill Callahan, Cat Power's Chan Marshall, Kim Deal, Frank Black, Thom Yorke, Morrissey, Robert Johnson, John Lennon and even Billy Corgan. But, of course, the knife cuts both ways on this issue, and there are artists whom I hate for no other reason than the fact that I cannot get past that voice. The voices that haunt my nightmares? Wayne Coyne. Celine Dion. Dan Bejar. That dude from Frog Eyes. And if you don't hate me already, you will now: David Bowie. Sorry, but I just cannot get past that voice. 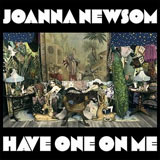 I'm sure my readers with at least a high school education can tell where I'm going with this one: Joanna Newsom is in possession of such a voice. And, oh, what a voice. It's not your typically divisive voice. It's not too nasally sounding or too falsetto or off key (well, maybe a wee bit off key). Joanna, let's see. . . how to put this. . . she sounds like Little Orphan Annie after she's been shrooming for about 48 hours in the town park. Also, she plays harp. I'm sure people will call the voice shrill or fey, and I admit it actually surprised me at first. But, here's the truly incredible thing: it works. Joanna's voice conveys a casual grace and belies an unnerving confidence. Her voice is a series of contradictions: she is as old as the moon and as young as a babe all at once; she is innocent and she is wise; she is detached and she is wonderfully alive; she is beautifully sad and wonderfully whimsical; and she is doing as much to revive folk as Devendra Banhart or Chan Marshall (in fact, she's good friends with Devendra and they play together in Vetiver; she also plays keyboards in the San Francisco based The Pleased, a kind of New York-ish sounding new-new-wave band). 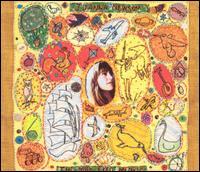 As "Bridges and Balloons" wiggles its way out of the speakers and you realize that Joanna is one of the finest storytellers to come down the pike in quite some time. To whit: "The sight of bridges and balloons/ Makes calm canaries irritable/ They caw and claw all afternoon:/ 'Catenaries and dirigibles/ brace and buoy the living-room/ A loom of metal, warp-woof-wimble'/ And a thimble's worth of milky moon/ Can touch hearts larger than a thimble." Newsom is full of wonderful knowledge and disarming romanticism, and has a way with words I'm not sure I've ever experienced before. Her voice is accompanied perfectly by spare, striking melodies played on either harp, harpsichord, wurlitzer or piano by Newsom herself. Aside from slide guitar on a few songs, there is only the voice and the lone instrument she plays. 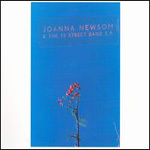 That Newsom can create a world so rich and lush out of such crude instruments is a credit to her brilliant tales of love and loss as well as her skill on the harp and other instruments (she's classically trained, and it shows). Her sound is rooted in the kind of Appalachian folk music that you can kind of hear in your head as you drive through the Smokey Mountains or as you read a book like the Stones of Summer (and if you haven't made that drive or read that book, they're both worth while). Hers is a soundtrack to a lost America, a rusted country in the same vein as Iron & Wine's impressive The Creek Drank the Cradle. On "Clam, Crab, Cockle, Cowrie," Newsom sounds more somber and it results in one of the more beautiful tracks on the album: "O morning without warning like a hole/ And I watch you go/ There are some mornings/ When the sky looks like a road/ There are some dragons/ Who were built to have and hold/ And some machines/ Are dropped from great heights lovingly." But as easily as she can inspire scenes of bleached Southern Americana beauty, she can drop a verse so tight on you that'll leave your head spinning. On the wonderfully jovial "Inflammatory Writ," she croons: "And all it once it came to me/ And I wrote and hunched 'till four-thirty/ But that vestal light/ It burns out with the night/ In spite of all the time that we spent on it/ One bedraggled note of a sonnet!/ While outside, the wild boars root/ Without bending a bough underfoot/ O it breaks my heart; I don't know how they do't"
The Milk-Eyed Mender is a stunning album. 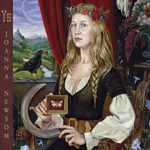 And Joanna Newsom is as fine a talent as the massive genre that 'singer/songwriter' has to offer these days. Some will say that she sounds more like an eight year old than a twenty-two year old, but her wonderful way with words and stories is a treasure that will last far far longer than the next dance-punk style summer craze that the hip kids start screeching about. If you like Devendra Banhart or Animal Collective or have a taste for any of the strange voices I listed at the start, you simply have to hear this album. If you like the voice, it's a record you will cherish. If you don't, hey, what do I know? I don't even like Bowie.